We had so much fun with our fruit stamping crafts. So, we’ve decided to add celery to the mix! 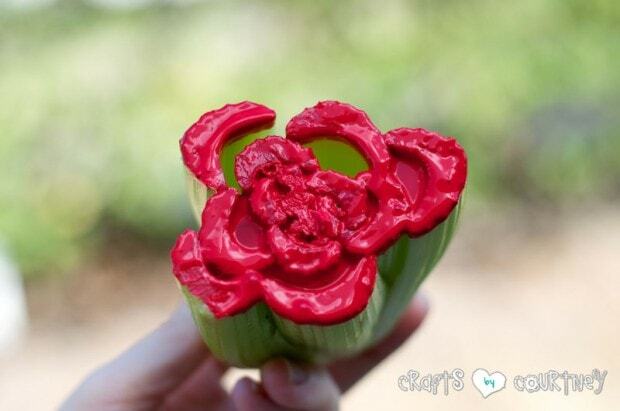 One of the reasons I wanted to do celery stamping is because it looks like a flower! How cool is that? 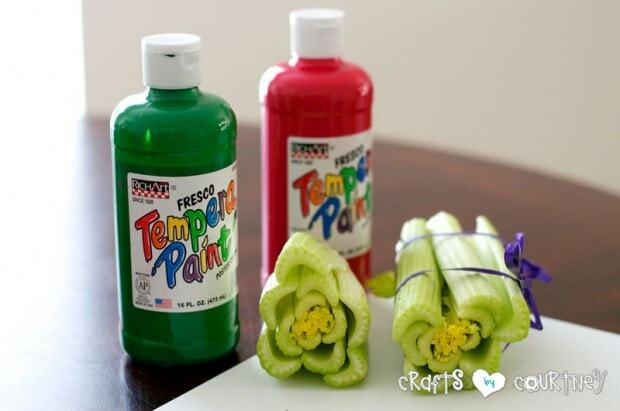 This is a perfect craft to do when your going to have some celery for a snack that day! Snacking and crafting now that’s what I’m taking about! We actually did a couple different crafts with this one. There was just so many ideas I had to do them all! I grabbed some celery and a couple different paint colors. Since the stamp is going to look like a flower I wanted to use some “flower-y” colors. 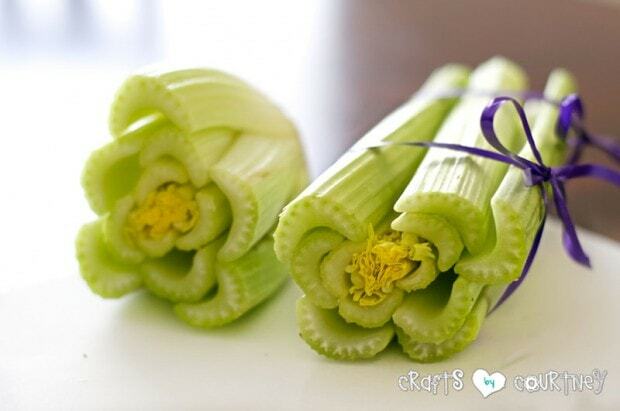 I cut the bottom half of the celery stock off to create our flowers. 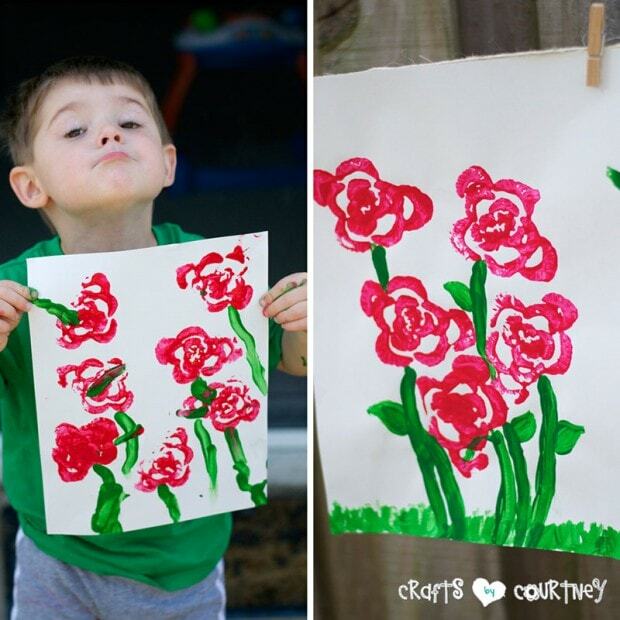 I had my son gently dip his celery into the paint making sure it was completely covered so we would get a nice flower shape. Quick Tip: If you see that the paint is a little “gunky” in spots just blow on it and it will “pop” the air bubbles. 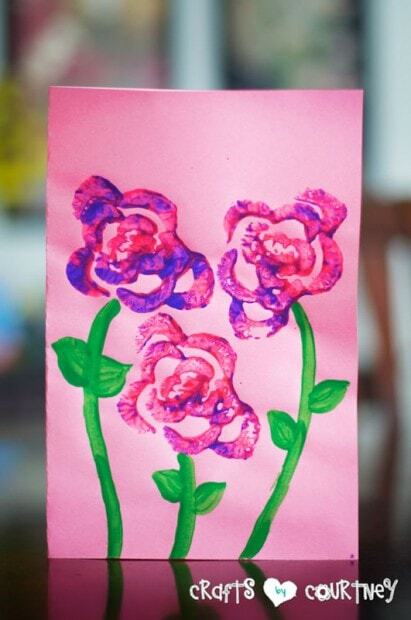 Stamp your celery gently on the paper creating your flower. He was amazed that it actually looked like a flower! We have done several food stamping crafts but I think this was by far his favorite. Quick Tip: The best way to have your paint ready is by using a large paper plate. Make sure your paint is spread out over the plate and your ready to go! We did a couple different ideas. Some I just had him stamp the celery all over the page and another we actually tried making a bouquet. I was really amazed at what a great job he did once he got the hang of it. My flowers are on the right, I can’t let my little guy have all the fun! Our attempt at celery stamping was a success!! Yay!! It does take a little practice to get it since the paint can get a little gunky but the results are well worth it, just have a little patience. We even made this card for a friends birthday. I can see this used for so many things. Maybe we can make some wrapping paper next time!